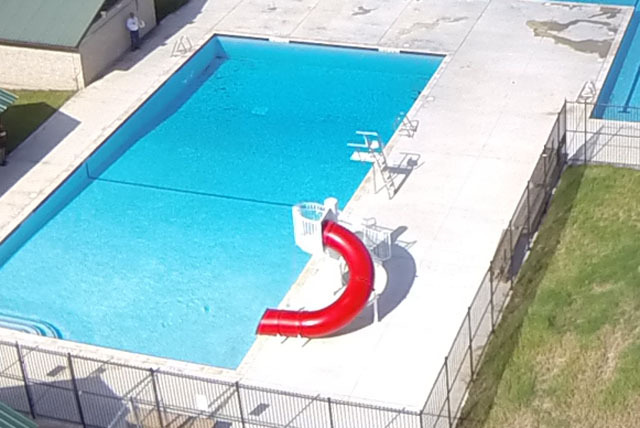 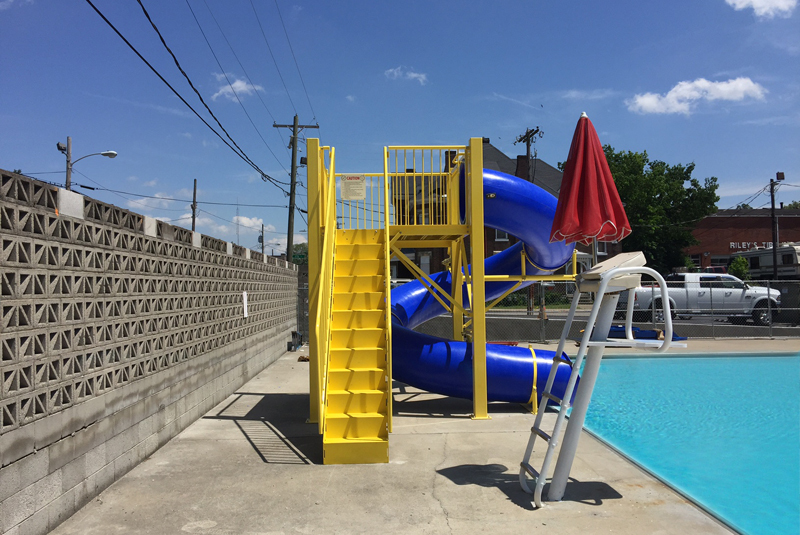 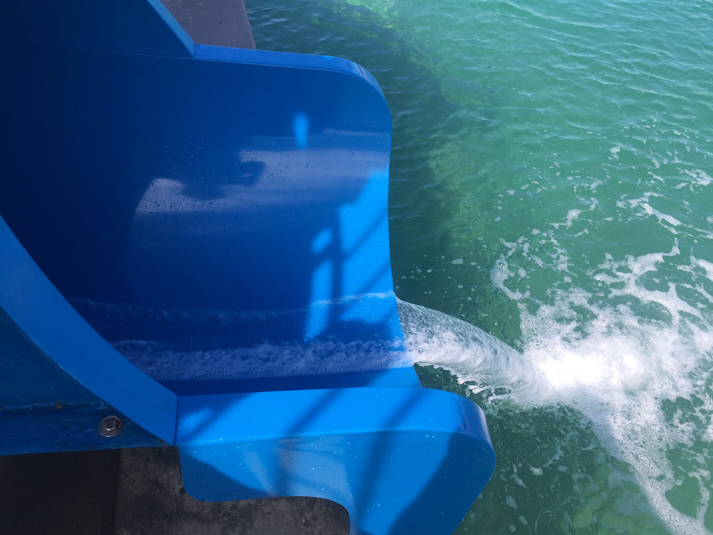 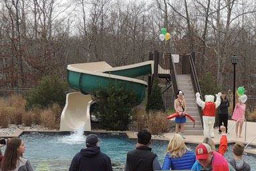 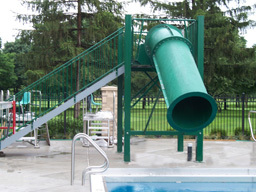 Description : Single open flume fiberglass water slide. 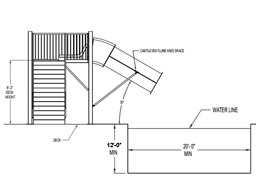 Centerline Run : 28' 2"
Entry Height : 5' 3"
Space Requirements : 16' 0 " x 16' 0" – Space requirements may vary with options chosen. 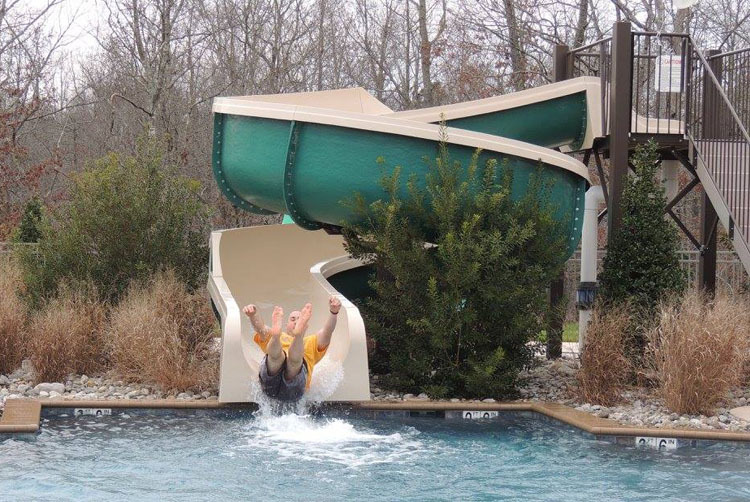 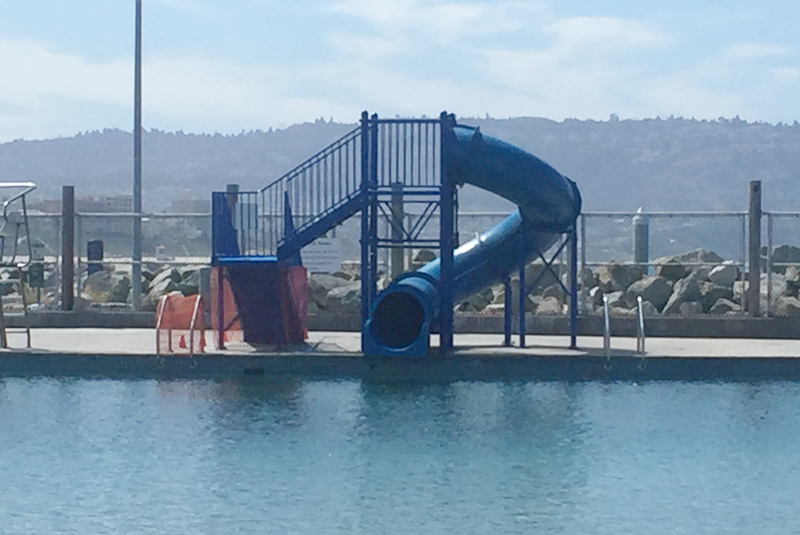 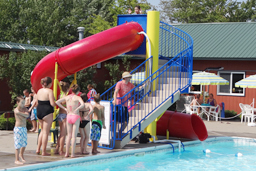 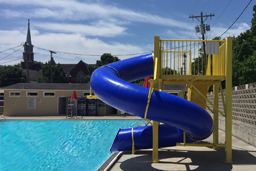 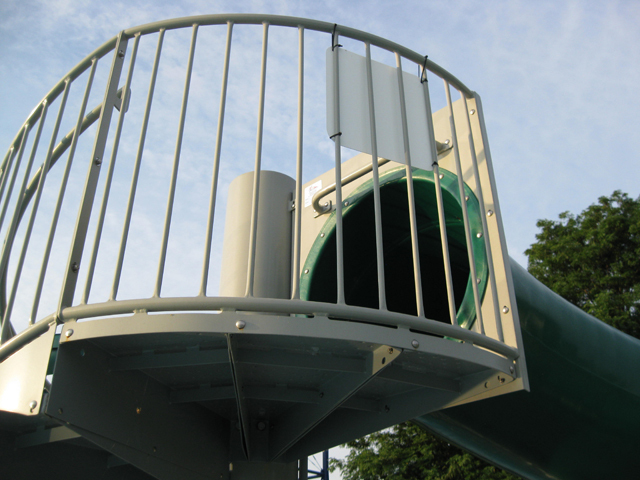 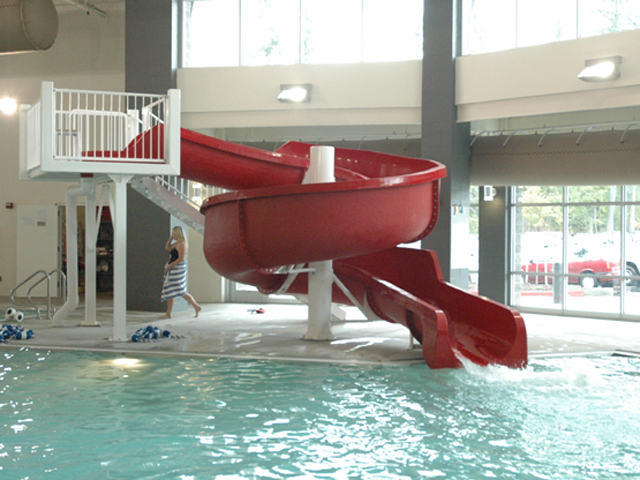 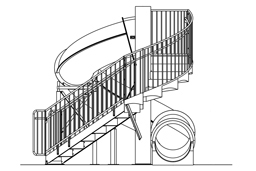 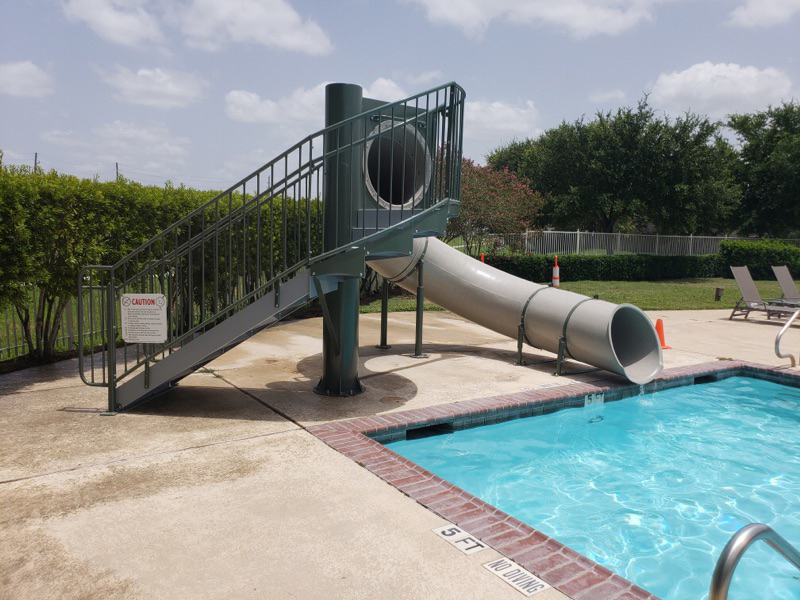 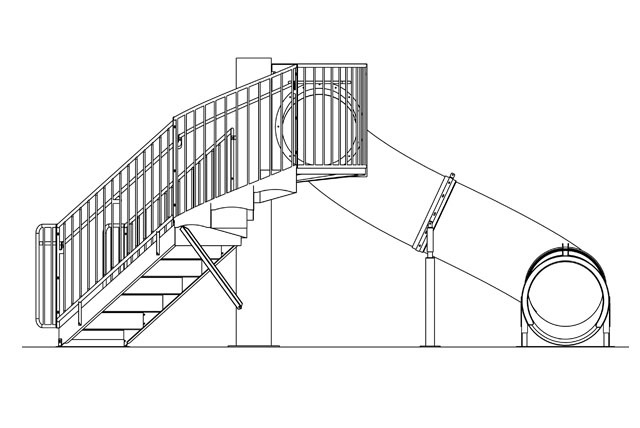 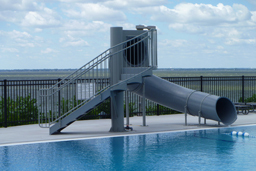 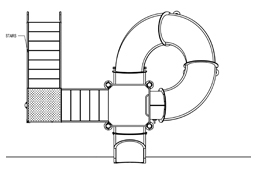 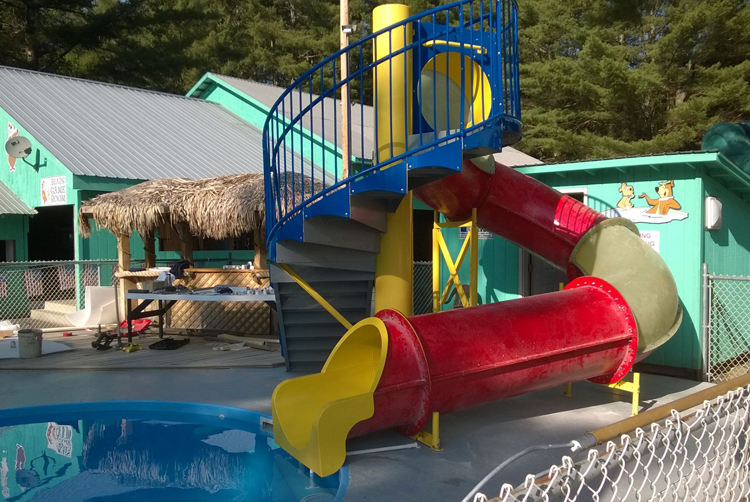 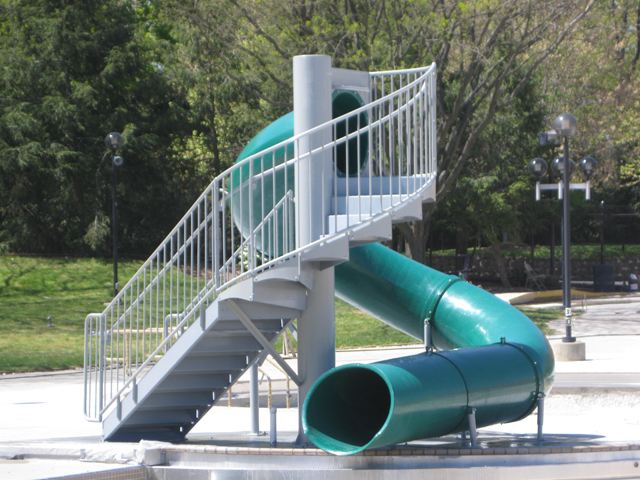 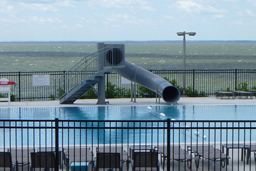 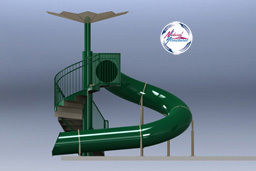 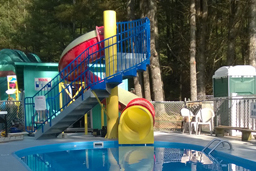 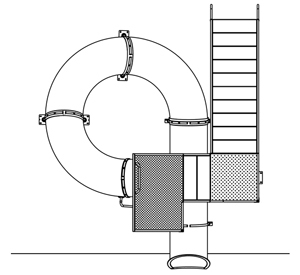 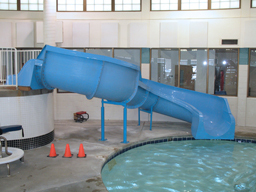 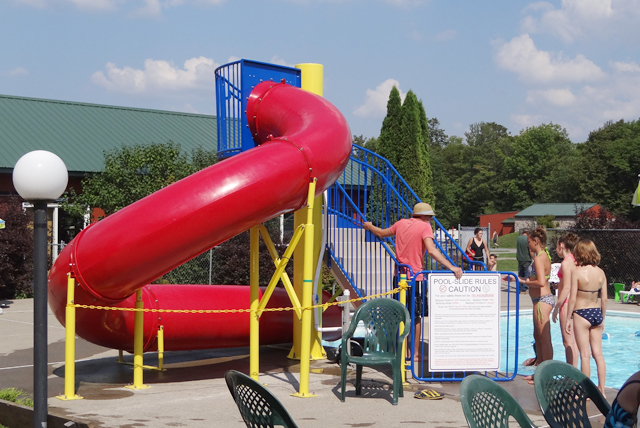 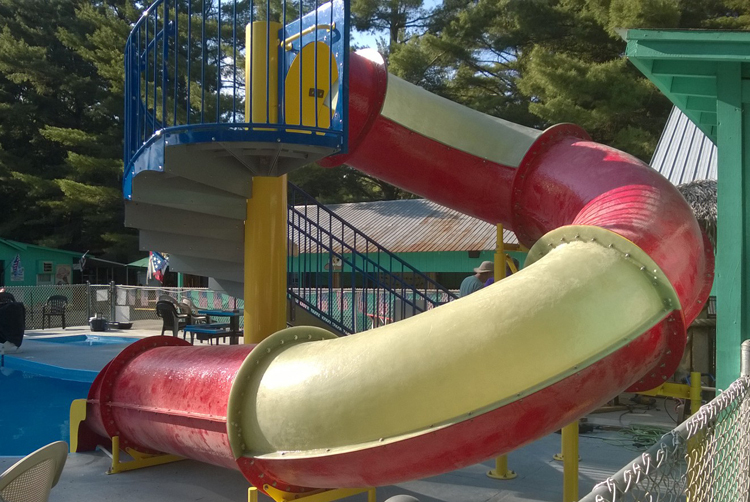 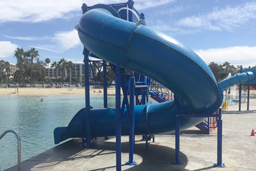 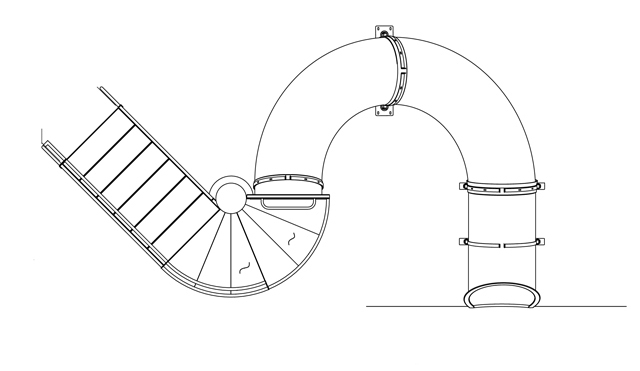 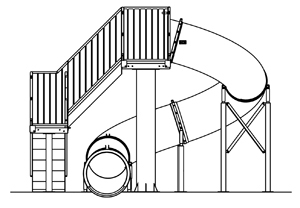 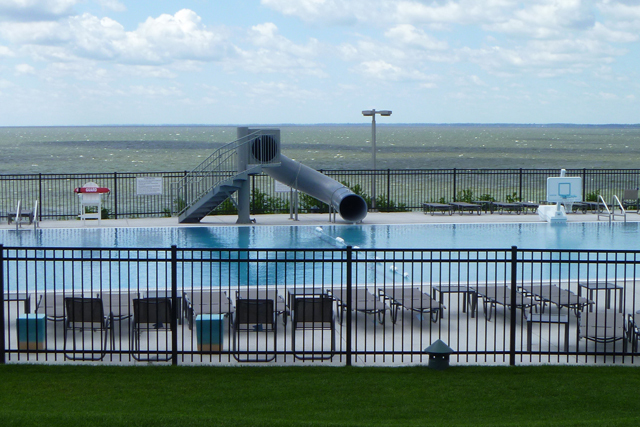 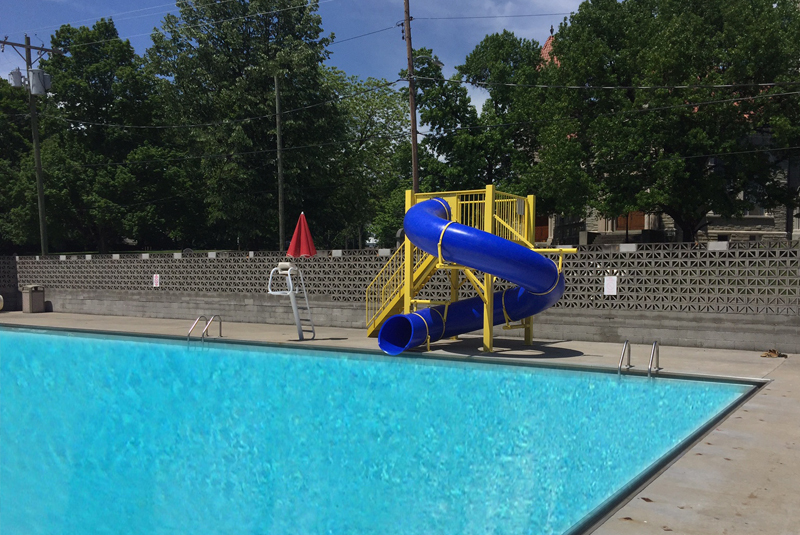 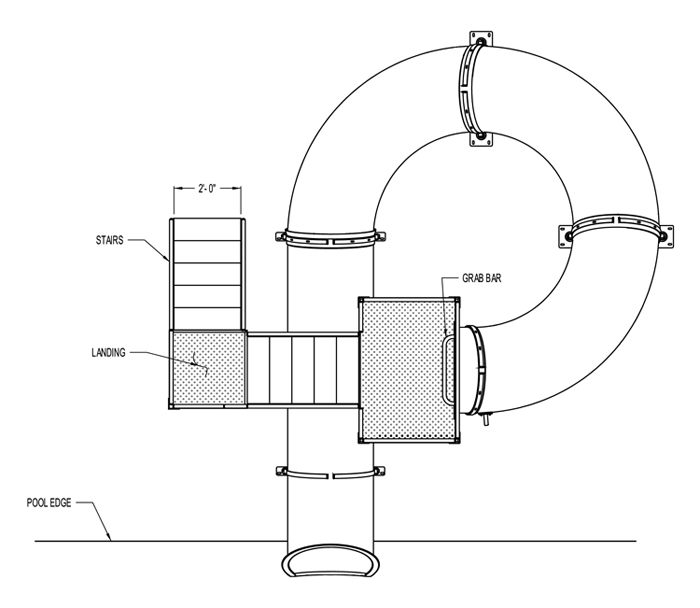 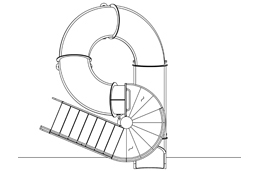 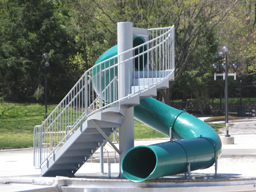 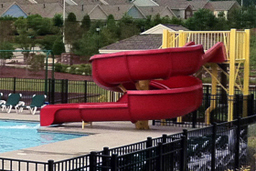 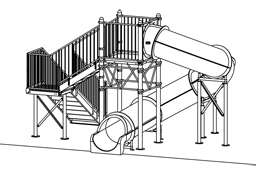 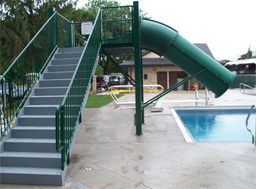 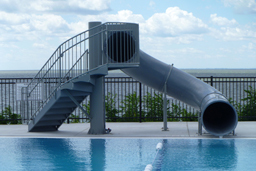 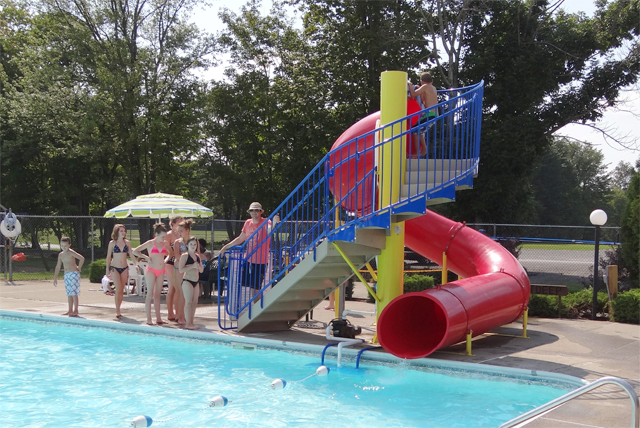 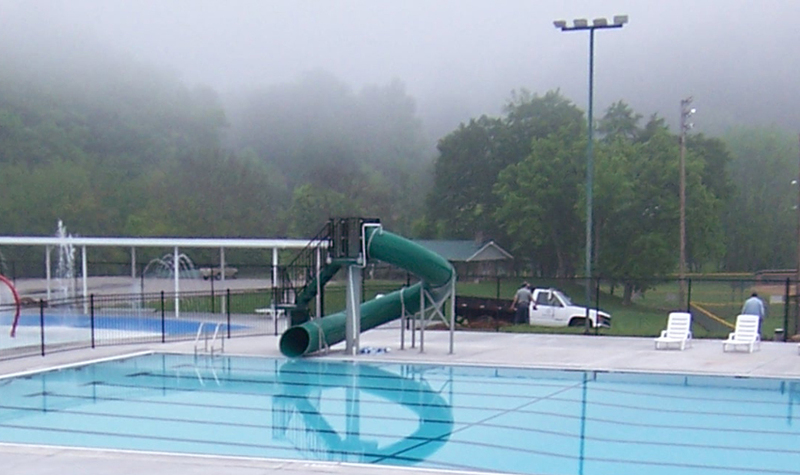 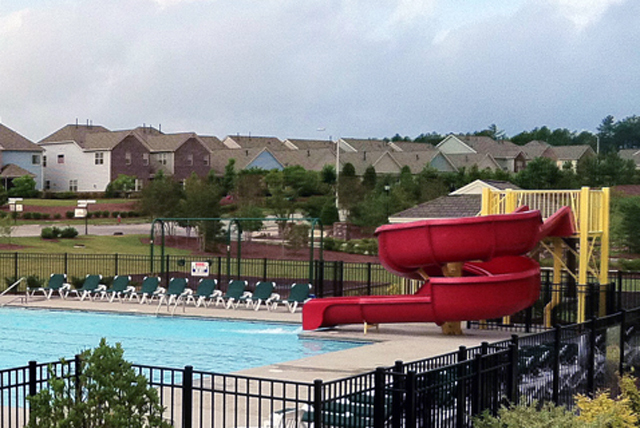 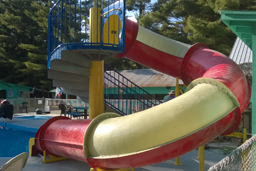 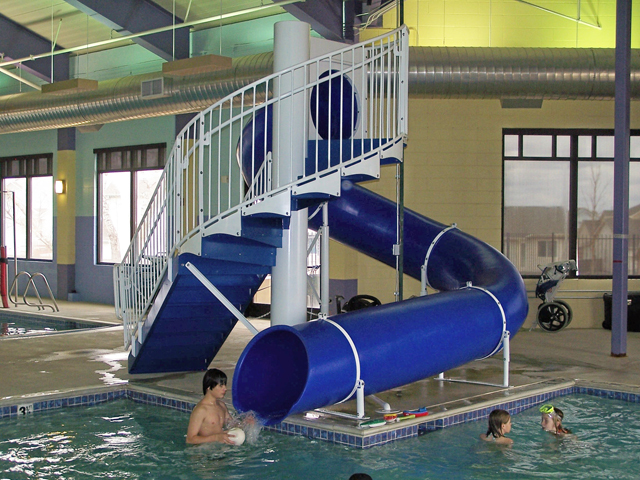 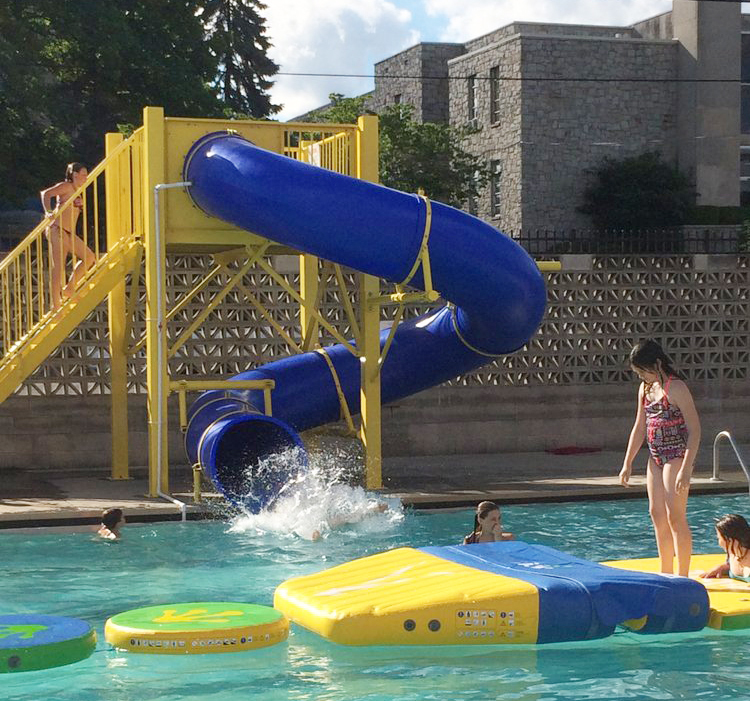 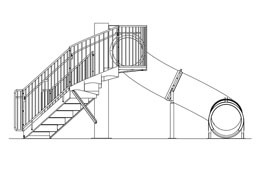 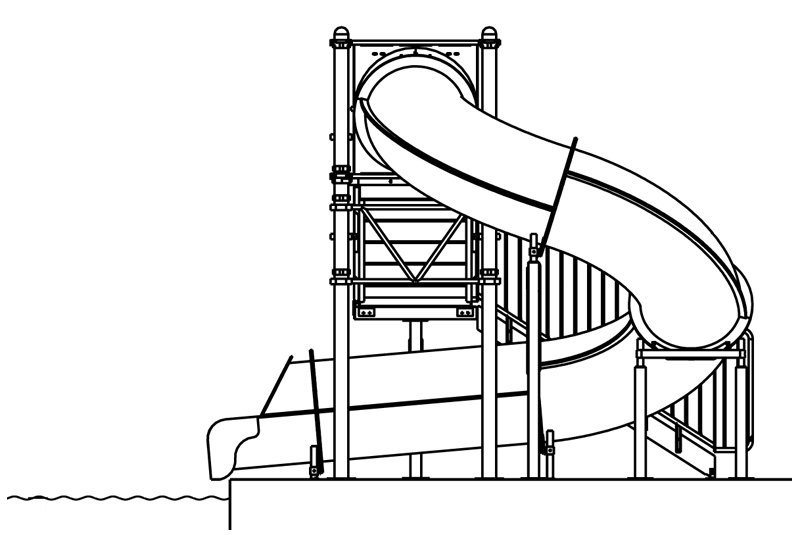 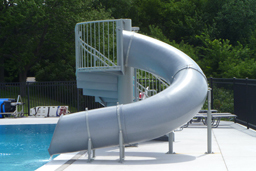 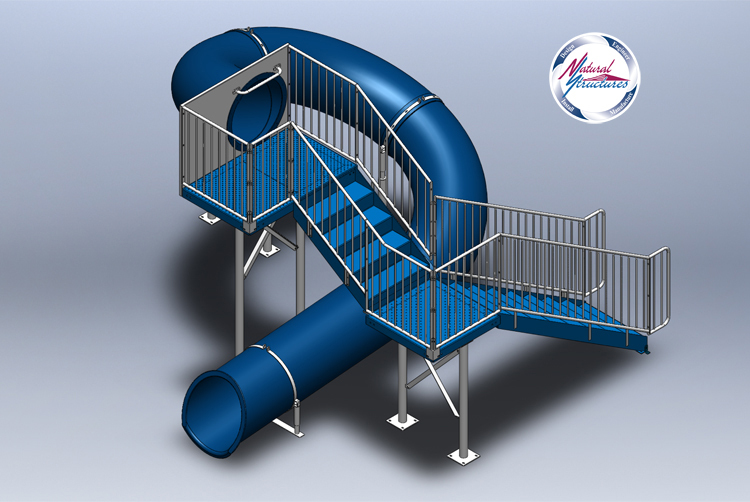 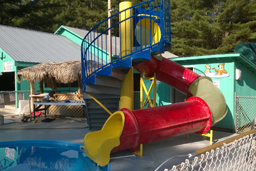 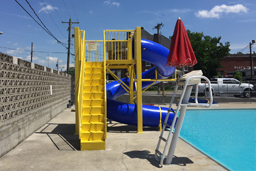 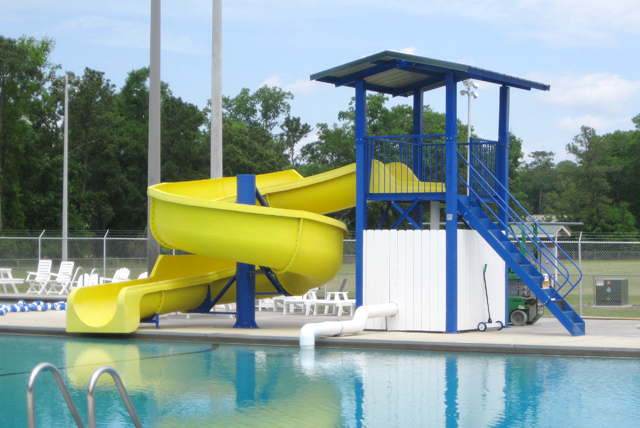 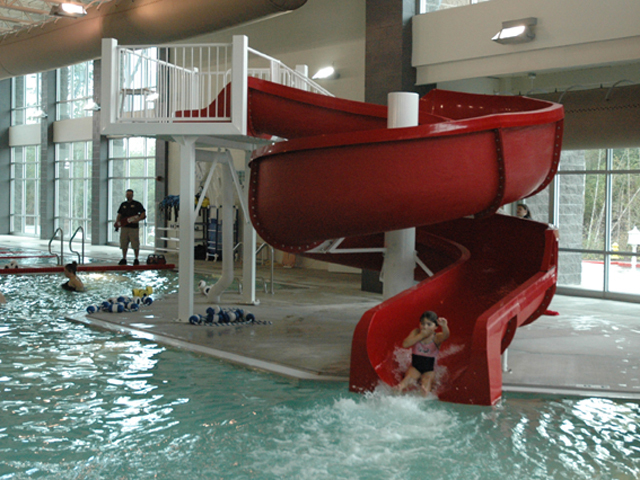 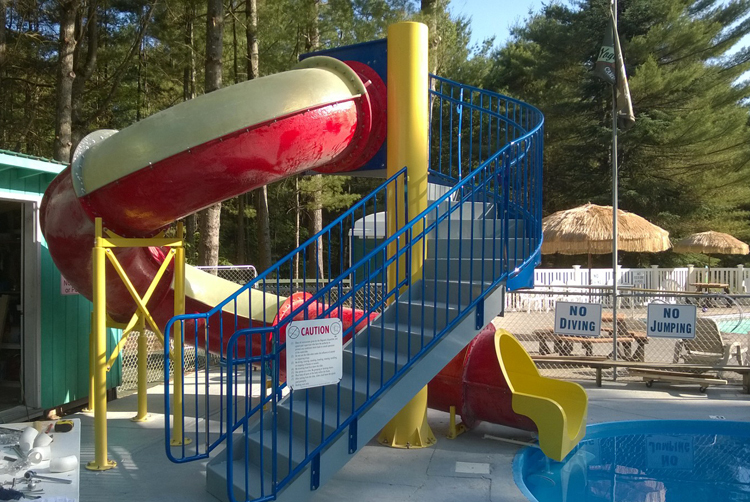 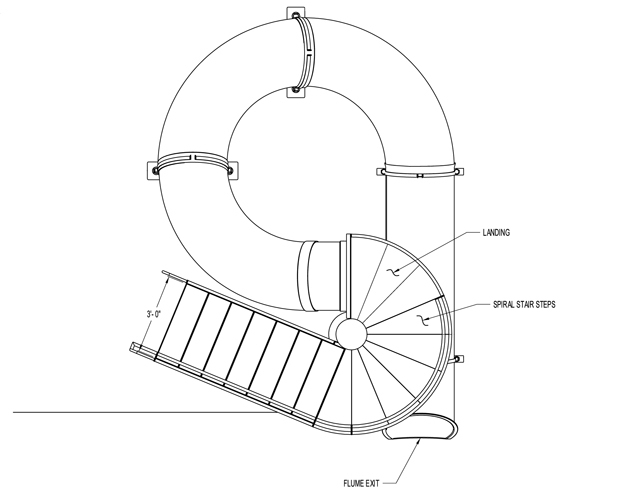 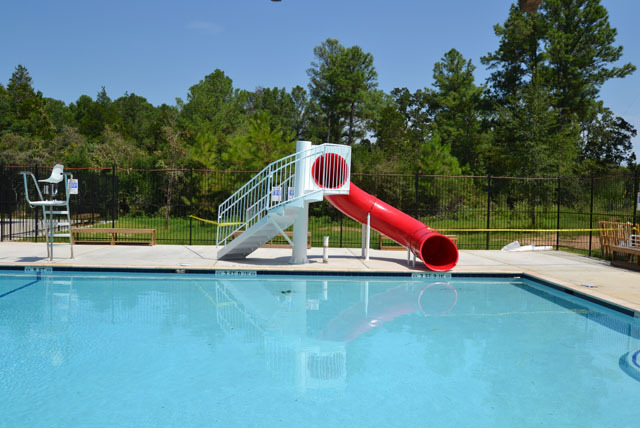 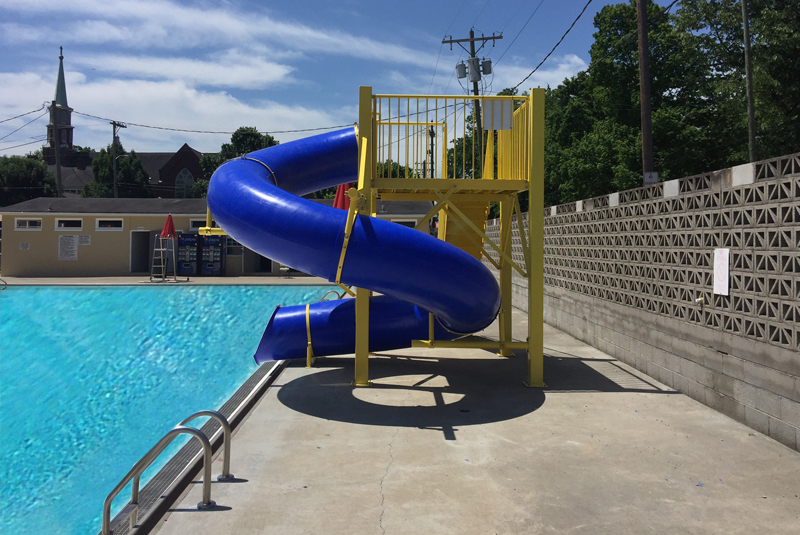 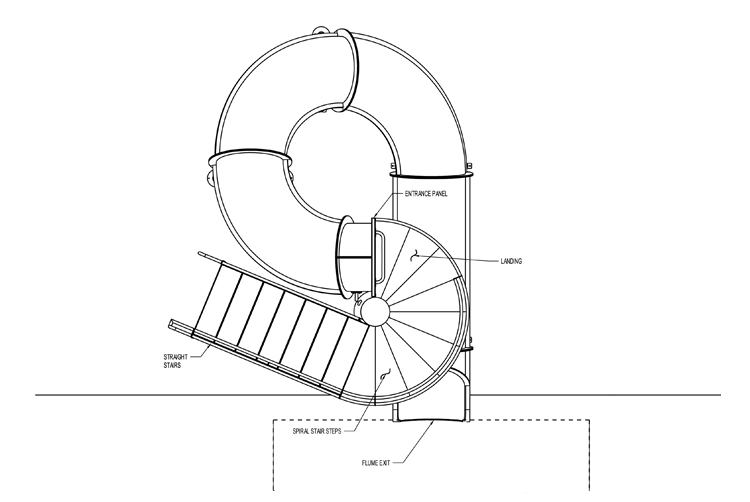 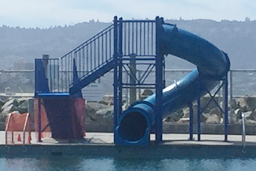 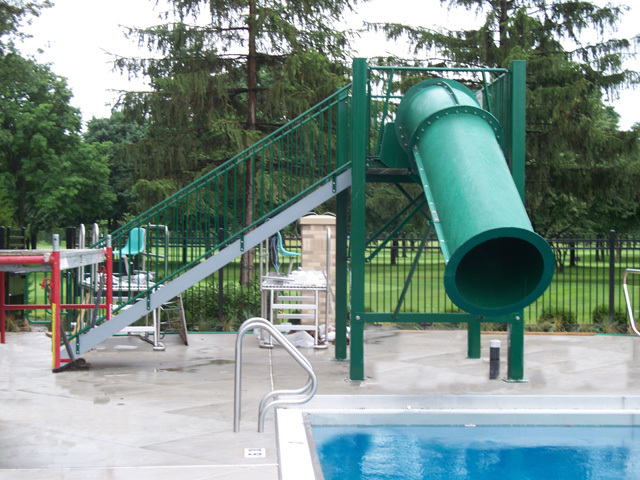 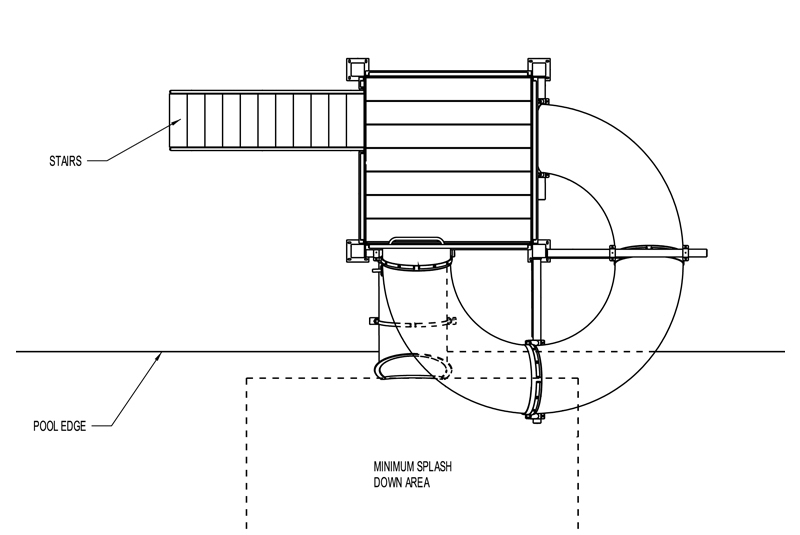 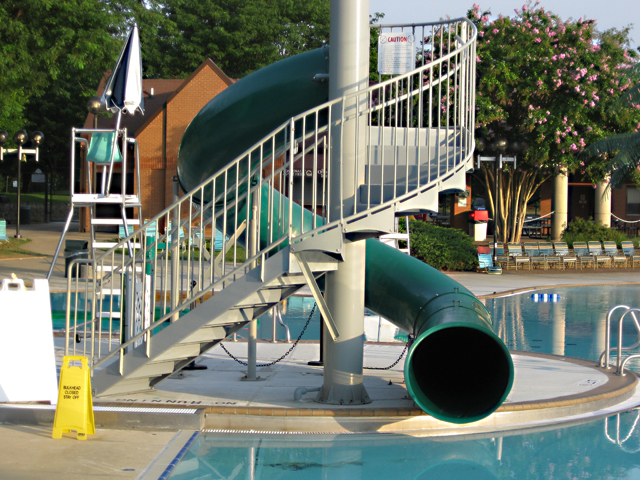 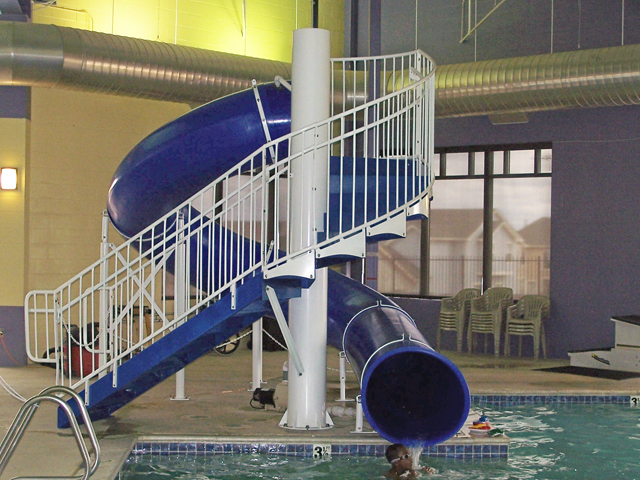 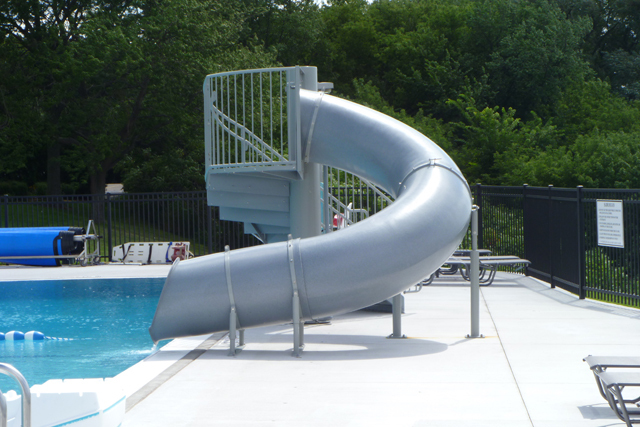 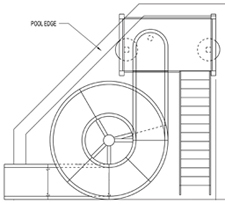 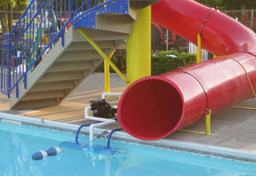 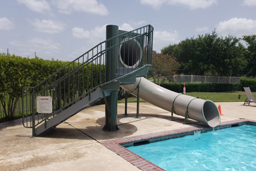 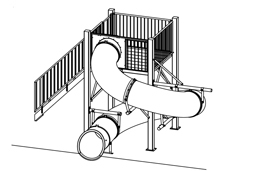 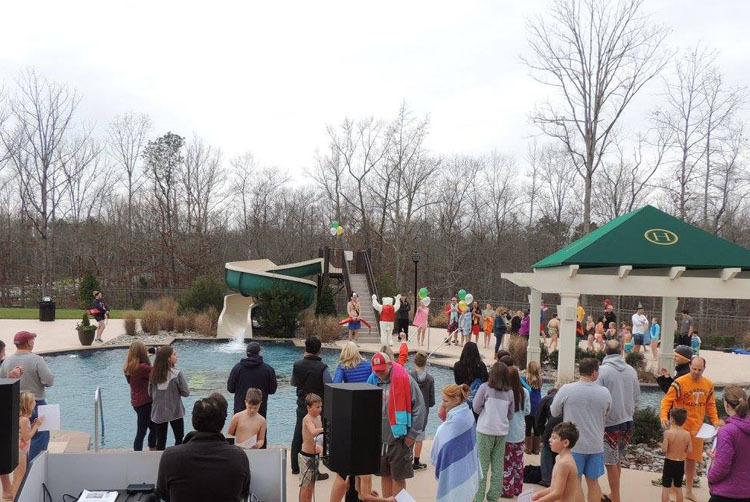 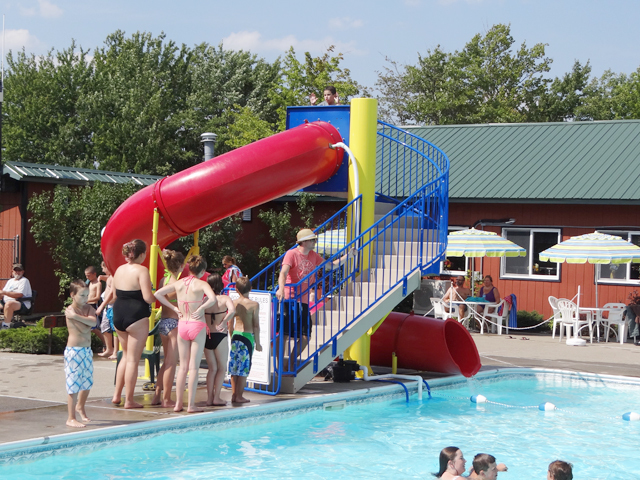 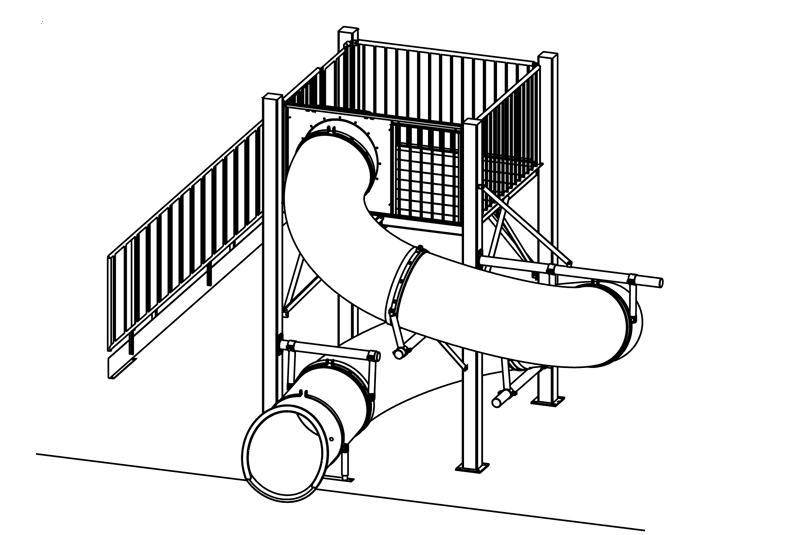 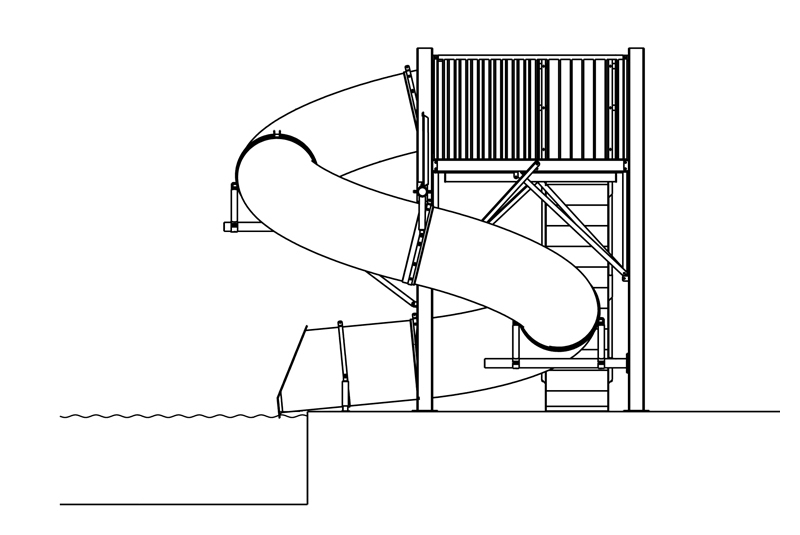 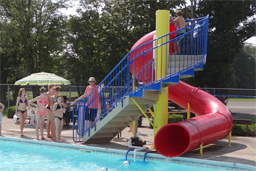 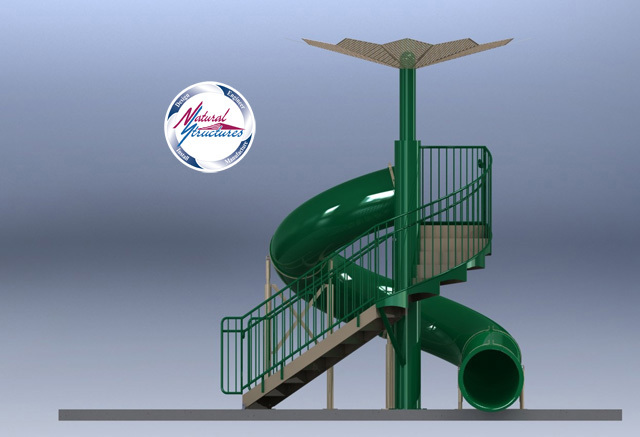 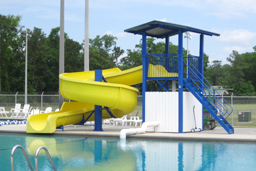 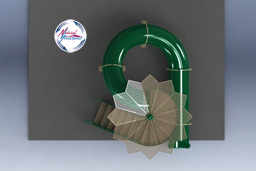 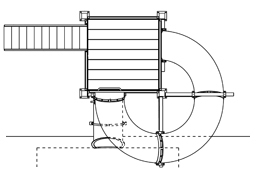 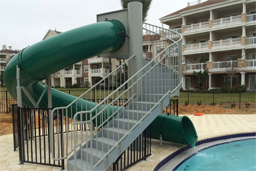 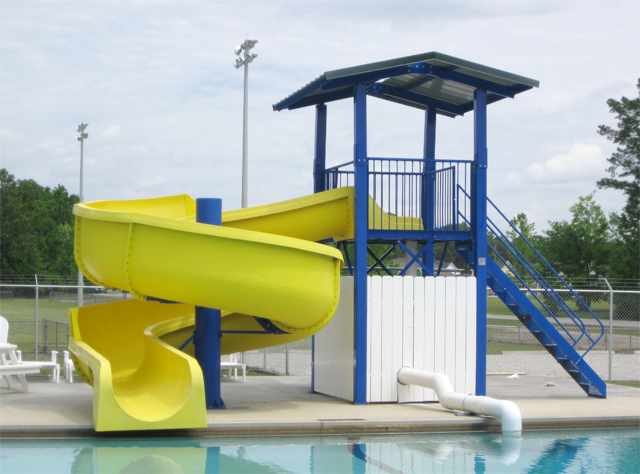 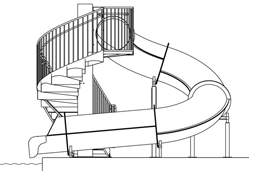 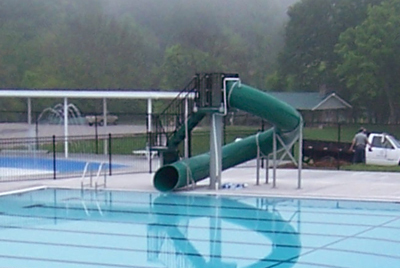 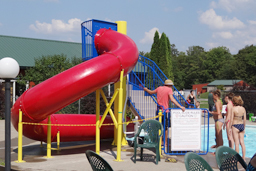 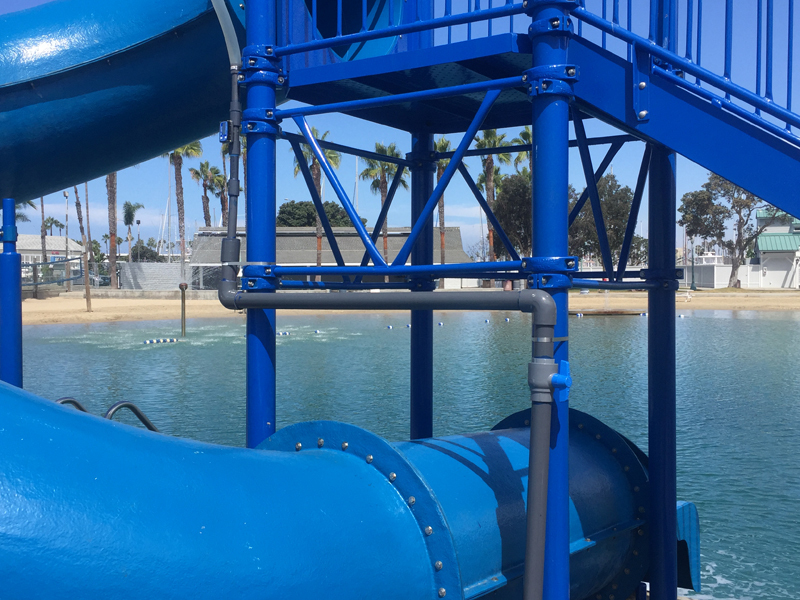 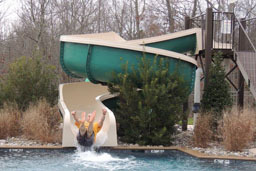 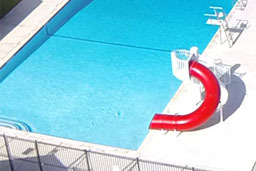 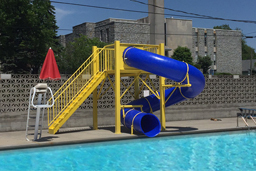 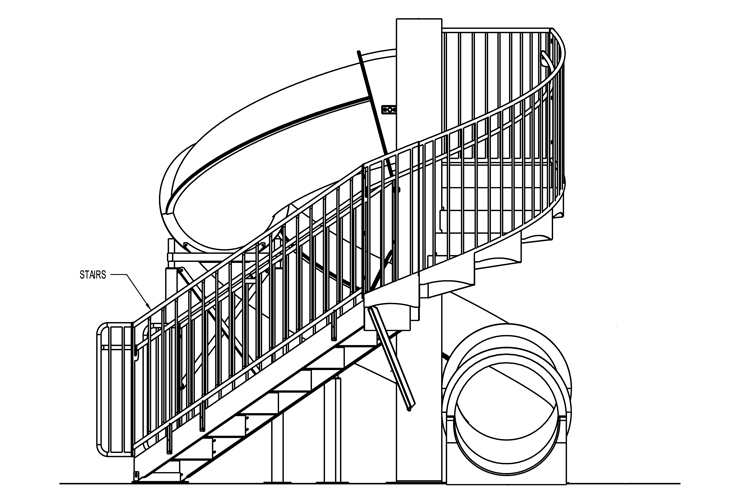 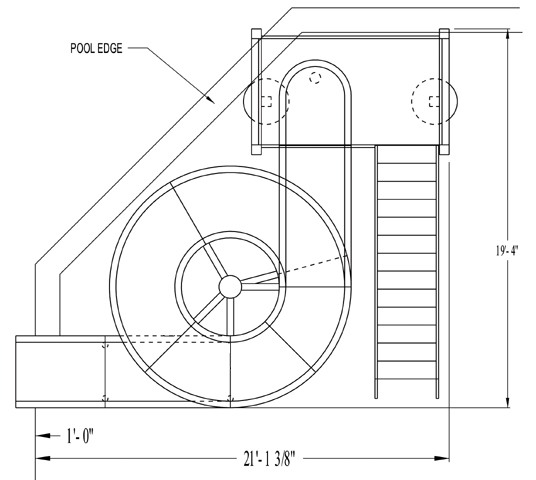 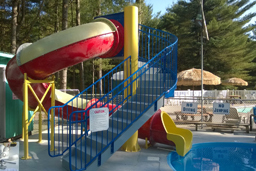 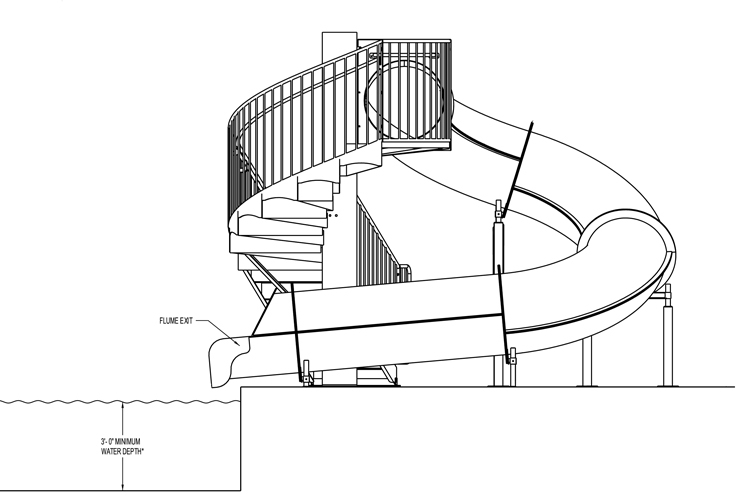 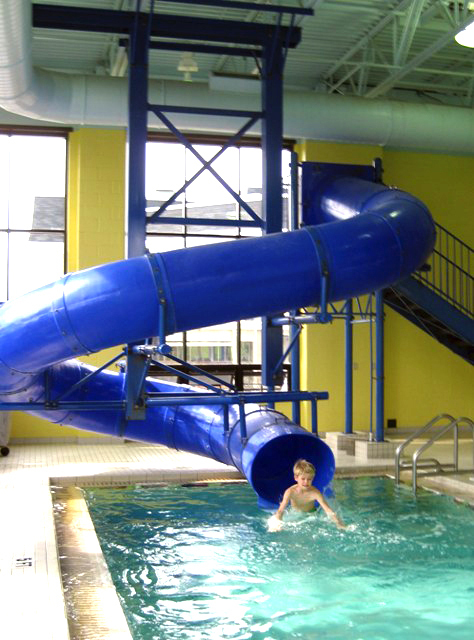 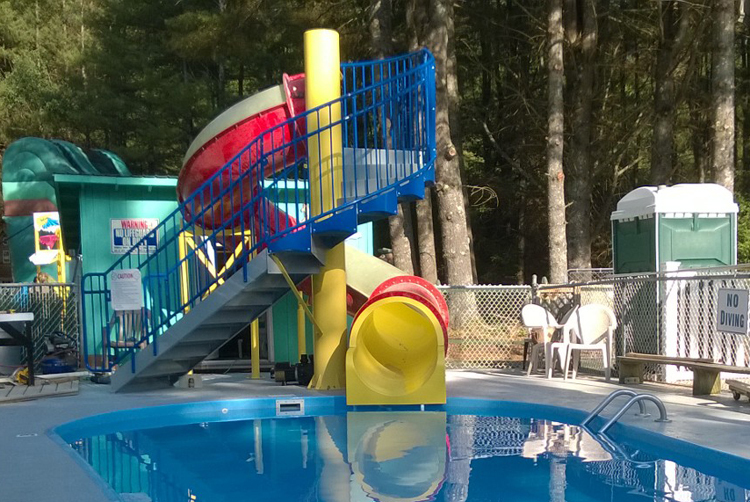 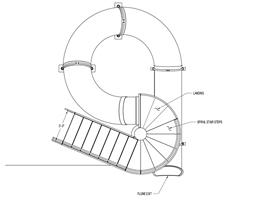 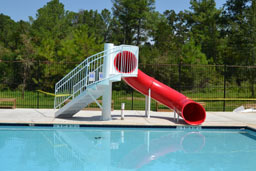 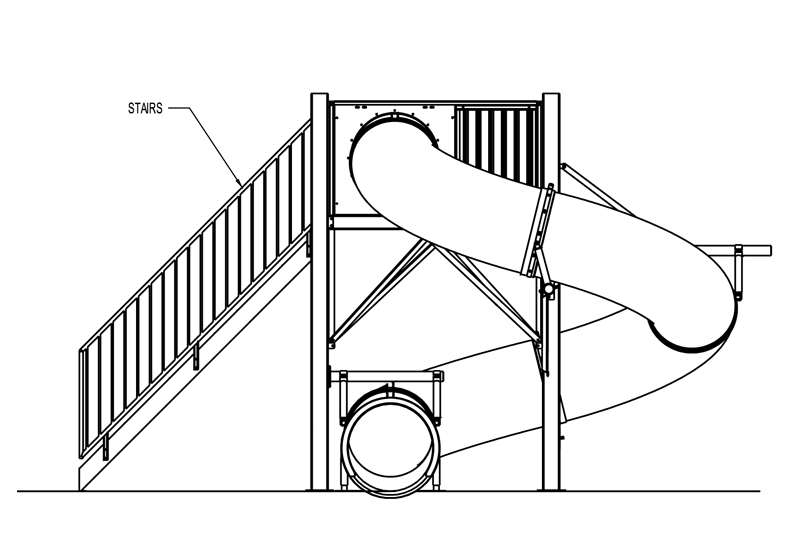 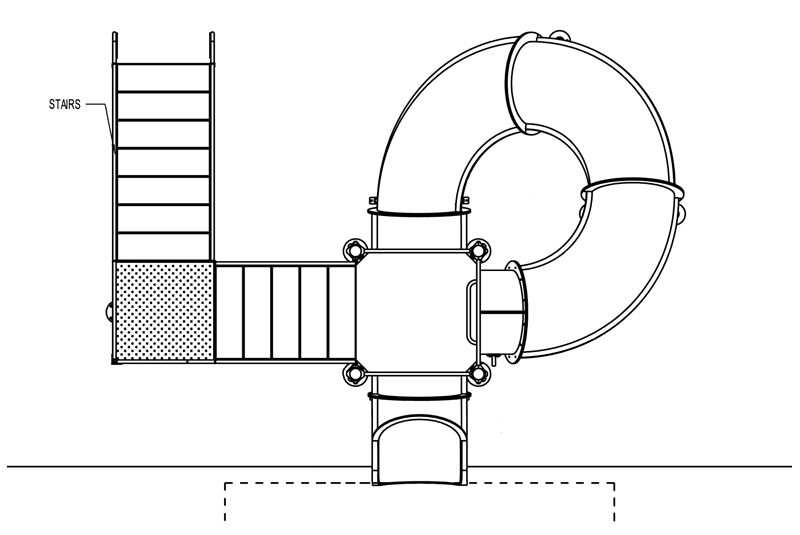 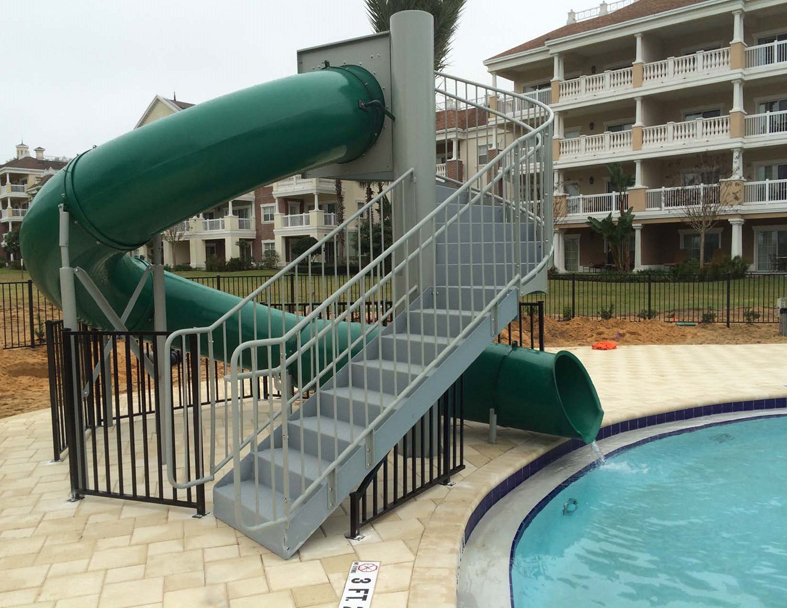 Description : Single open flume fiberglass water slide with 1¼ spiral. 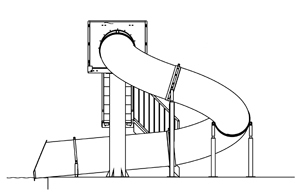 Centerline Run : 55' 3"
Entry Height : 8' 2 "
Space Requirements : 21' 2 " x 19' 4" – Space requirements may vary with options chosen. 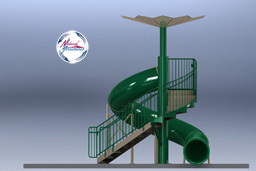 Description : Single 32" I.D. 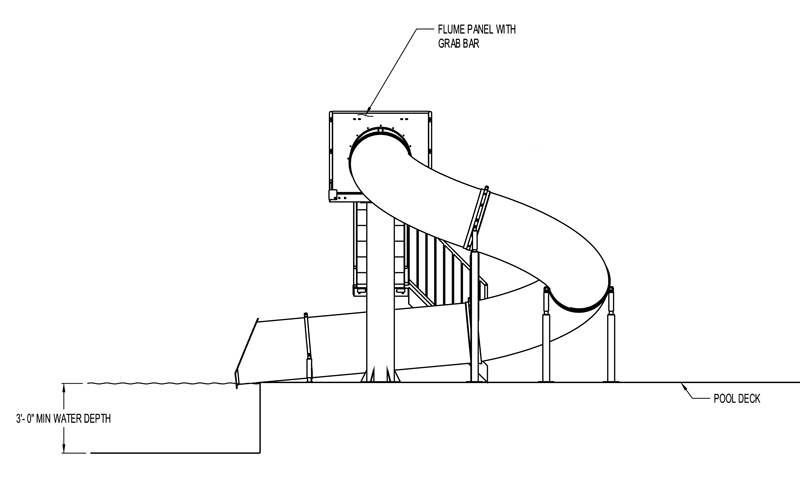 closed flume fiberglass plunge slide. 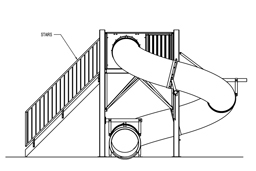 Space Requirements : 12’ 3" x 14' 10" – Space requirements may vary with options chosen. 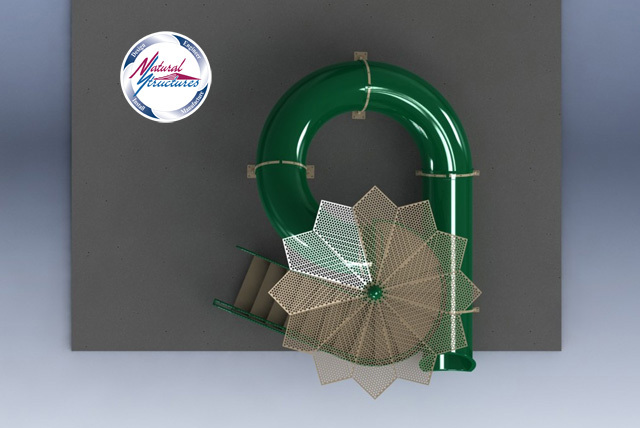 Description:Single 30” I.D. 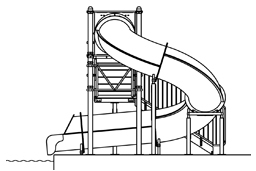 flume slide with one 360° turn. 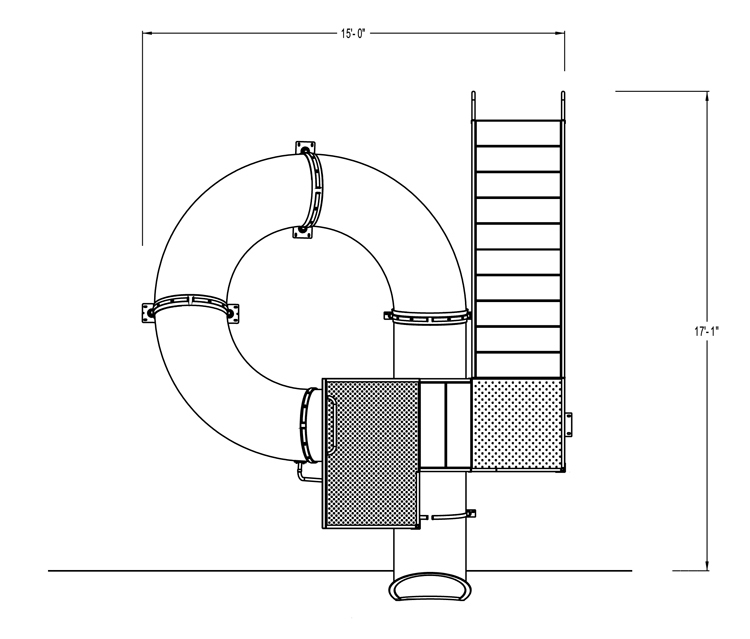 Space Requirements: 20’3" x 11' 1" – Space requirements may vary with options chosen. 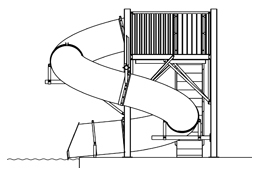 Entry Height : 8' 8"
Space Requirements : 15’ 2" x 12' 6" – Space requirements may vary with options chosen. 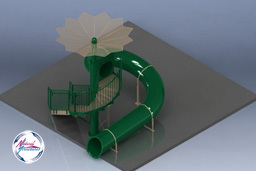 Green flume: 15’1" x 15' 3"
3D: 15’0" x 17' 1 "
Description : Double flume 30" I.D. 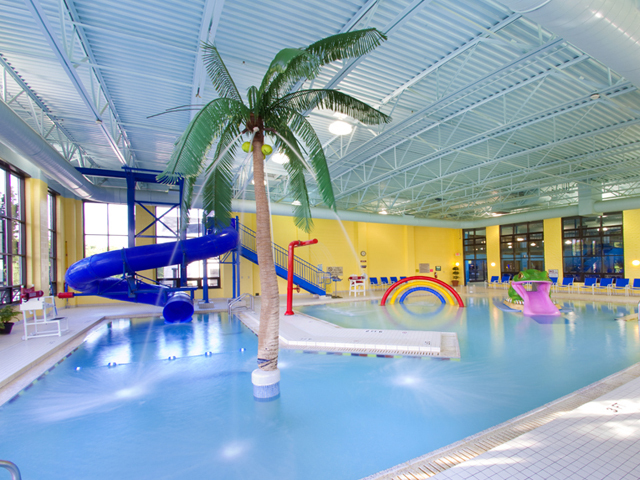 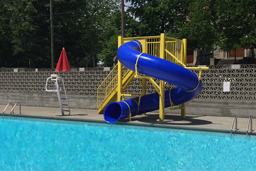 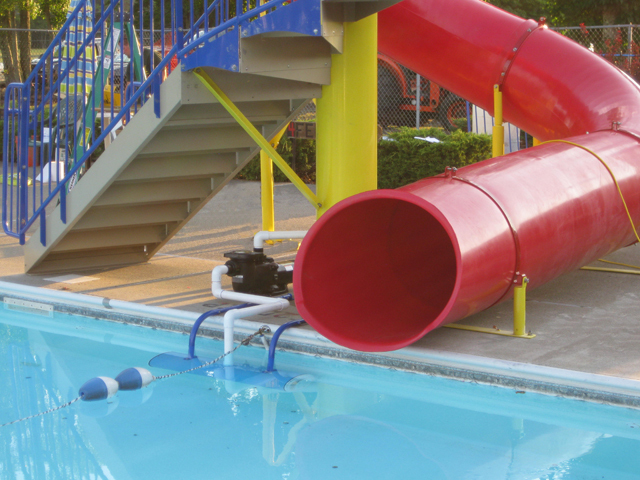 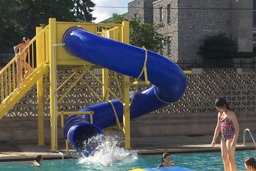 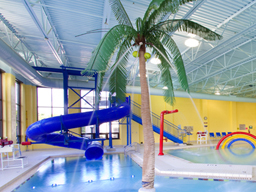 polyethylene waterslides with two 360° turns. 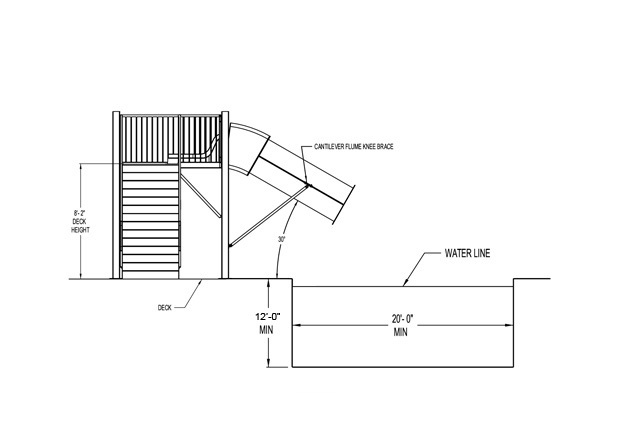 Centerline Run : 29' 9" & 32' 10"
Space Requirements : 27' 6" x 11' – Space requirements may vary with options chosen. 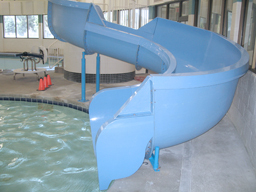 Description : Single 30" I.D flume water slide, ceiling mounted with 360 ° turn. 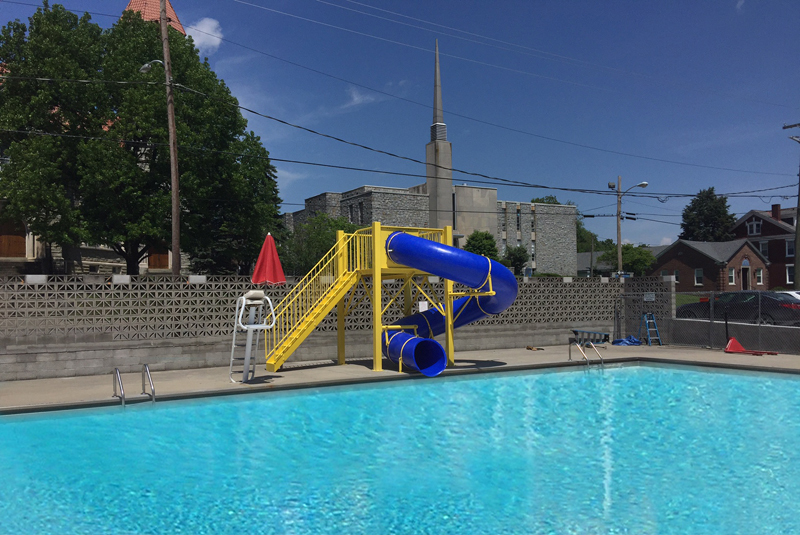 Entry Height : 9' 10"
Space Requirements: 16' 4 x 32' 7" – Space requirements may vary with options chosen. 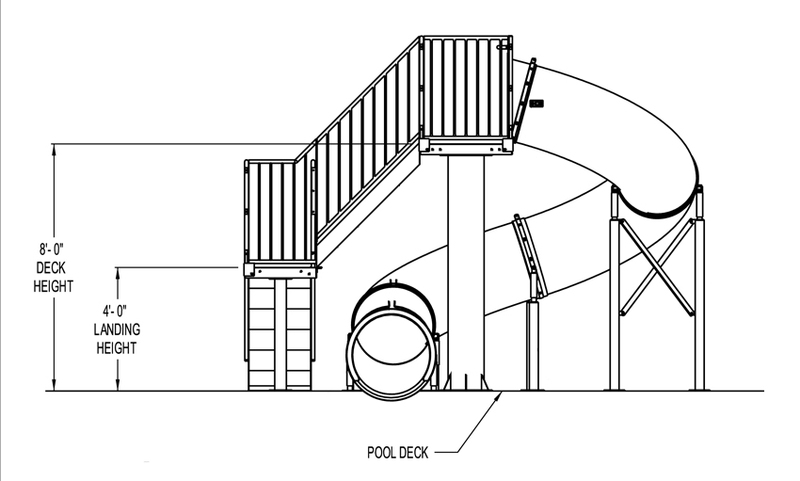 Hang your pool from the ceiling!